A very practical backpack for traveling and day to day functions. Very sturdy with the number of heavy books, laptop and iPad Plus, in addition to chords and smaller items. The side pockets are high enough for my tall water bottle, so it doesn’t easily fall out when I am holding the backpack at an angle. The top handle helps with pulling the backpack down from the overhead bin on the plane. And the outside laptop pocket is very useful with enough padding to protect the equipment. Did get a small hole on the front side due to sliding against a brick wall. Easily covered it up with a sticker. I've had this bag for about five months, and so far it's been great. I've used it for multiple flights as well as carrying things around on the day-to-day. The bag is sturdy, the pouches are placed well so the interior doesn't get clogged by pouches with external access that are housed in the main compartment (a huge pet peeve of mine), and it's the perfect size for overhead storage on planes. 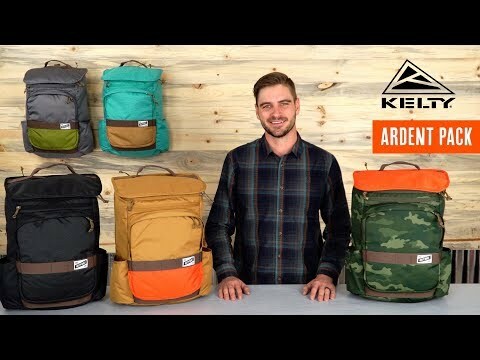 I have been using Ardent backpack for about 3 months. I use it both as my casual backpack (for my everyday commute to work) and as my travel backpack (for short trips). And the more I use it, the more I love it. The bag is really sturdy. It has an accurate and nice look. The bag's material has a pleasant soft feel and an interesting texture. Castle Rock color absolutely rocks! The bag also sits very comfortably on my back. It has good volume capacity (for example, on a usual day, I can fit in: my yoga clothes, a face towel, a mat towel or a thin foldable yoga mat, a cosmetic bag, a medicine/supplements bag, up to 5 200ml food containers plus a couple of fruit/vegetables, a tablet, a bag with adaptors and a power bank; and still, there will be room left). The bag's sleeves and pockets organization works very well for me, and I also like using Kelty stash pockets to organize some of my things inside the main compartment.